Wildfire, Cabazon, California, August 8, 2013. 1/500 sec., f/5.6, ISO 100, 35mm. SHOOTING LARGE SUBJECTS IS OFTEN MORE CHALLENGING THAN CAPTURING STORIES NEAR AT HAND. If you’re doing a tight frame around a bowl of fruit, there may be more than only one story for the shot, but, compared to trying to find the essential visual core of a vast area, it’s not really the stuff of MENSA club meetings. When you’re shooting tight, the message, the central spine of the idea reveals itself fairly quickly. Panning over an immense scene, the story is “out there”, but your editor’s eye will certainly get a more rigorous workout in paring away the unneeded extras. Important note before we continue: I am not a storm chaser. I lack the mixture of admirable fortitude and creepy bravado that allows people to take truck and gear in hand in an insane game of dodge-ball with a meteorological Godzilla. So, if I am in the position to grab a moment during one of Mother Nature’s more picturesque tantrums, it’s purely a case of being in the right place at the right time. I am not intrepid. To my thinking, the only thing cool about being Indiana Jones is, you get to wear a seriously rockin’ hat. Thus, the above frame is largely luck, the very casual luck associated with pulling off the road for a rest stop precisely as something is becoming interesting. 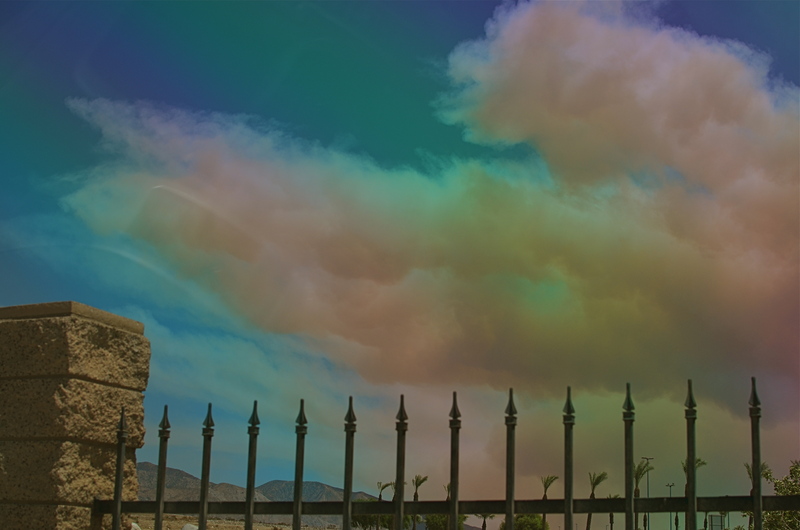 The cloud you see belongs to a horrible wildfire that tore through more than 20,000 acres in California’s San Jacinto Mountains last Thursday, August 8, 2013. From our westward trek toward Los Angeles on the I-10, most of what we saw of the fire, for nearly 100 miles, was a dense, diffuse haze which more closely resembled Pollution’s Greatest Hits of 1968 than a fire. However, during our leg-stretcher at the wonderful Hadley Fruit & Nut superstore in Cabazon, California, it was finally possible to see a salmon-colored, tightly defined cloud of fire smoke, snaking its way southward across the freeway, billowing to the size of a football stadium over the mountainous terrain near our car. The cloud was a free, here-you-are gift, the central part of the story, but the shot wasn’t ready. I needed some earthly point of reference to convey its size, and all I had were distant palm trees and fairly featureless terrain. Fortunately, there was a short masonry wall that marked Hadley’s lot from those of its neighbors, and, crouching down a bit, I could bring it into frame as some way to contextualize the cloud monster. The other problem was haze, which was rendering all colors too faintly, given the high position of the sun reading off the smoke. A simple screw-on polarized filter cut the haze and delivered the hues. Click and done. Back in the car, far away from the Devil Cloud, and on to L.A.
With a lucky frame in the back seat. And walnuts and raisins in the front. This entry was posted on August 13, 2013 by Michael Perkins. It was filed under 35mm, Polarization, Prime lenses, Scenic, Textures, Tonal range, Viewpoint, Weather and was tagged with Cabazon California, Los Angeles, Mountains, Polarization, Weather, Wildfires.